Which Night Guard To Choose? 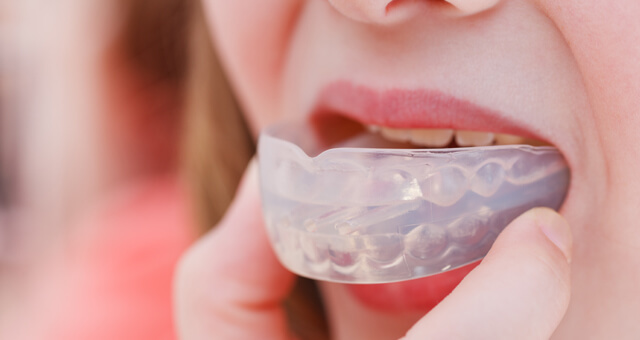 When it comes to teeth grinding, mouth guard manufacturers claim that they are very effective in protecting your teeth against excessive wear. Most of these products don’t make bold claims that they actually help people stop grinding their teeth. But, the use of top dental guards has a positive effect, since teeth grinding can damage your teeth and reduce the longevity of your dental restorations. However, using night guards will not cure bruxism (teeth grinding) or make you stop clenching. Instead, when you clench your jaw, you will be grinding your mouth splints and not your teeth. So, this is still quite helpful. This condition is commonly caused by stress and anxiety and it eventually becomes a habit. Smoking, drinking alcohol and beverages loaded with caffeine can also cause grinding of teeth while asleep. But it could also co-exist with sleep apnea (or difficulty in breathing while asleep), and conditions like Parkinson’s disease; a neurological disorder that causes involuntary tremors and muscle activity while asleep. Boil and bite. You have to literally boil it in water, bite into it and hope that this mouth protector made from thermoplastic material fits your unique mouth structure. Use finger and tongue pressure until it fits. You can buy this from sporting goods stores. While they could prevent dental trauma during sports, they could do little for your grinding. Stock mouth: They are inexpensive and bulky mouth protectors that provide little protection. Unlike boil and bite protectors, you can’t adjust their fit and they may interrupt with your breathing. They come cheap, but your dentist may object to its use. Custom-fitted: If you want a mouth protector that fits perfectly, a lab-fabricated occlusal guard is the best choice. Your dentist will make an impression and you may be able to get it after two weeks. The OTC mouth guards like stock mouth and boil and bite are designed to generally protect your teeth from grinding. But, remember that ready-made mouth guards are usually softer than the custom-fitted protectors prescribed by dentists. The size may not fit your dental condition and may cause bite and tooth alignment problems and worsen your grinding. Your best option is to get a custom-fitted rigid occlusal night guard from your dentist to avoid future problems. To be clear-the best mouth protectors do one thing-save your teeth from undue wear due to too much grinding. As it saves and protects your teeth, it is advisable that you go to the roots of your bruxism for lasting relief. All these techniques can ease tension and stress, improve your sleep and reduce grinding of your teeth. Dental work. Aside from a custom-fitted night guard, your dentist may require you to go through some dental procedures. If you recently had a crown which is too high, the abnormal alignment may trigger problems with your bite and teeth clenching. Your dentist would adjust it to prevent irritation and to solve the problem. Lifestyle changes. Cigarette smokers and heavy drinkers can have increase hyperactive muscle movement at night. So, you may want to reduce your alcohol intake and cigarette use. For better sleep, you can also stick to a sleep schedule, avoid heavy meals before bedtime and manage your worries. These things would keep you from tossing and turning all night. With lesser stress, you will probably grind less at night. Medication. If you have Parkinson’s disease or any neurological problem, your doctor can prescribe medications to reduce your teeth grinding at night. I just can’t bring myself to paying $$$ for my mouthpiece even though I have advanced bruxism. Is there a way to shop for mouthpieces? My dentist is expensive, IMO, in fact, I just paid $4200 for an implant. It came with a vanity tooth which I didn’t need and he did not ask.